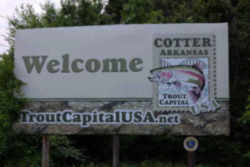 The City of Cotter, Arkansas, shall is be known and may be referred to as the "Trout Capital of the USA". With a name like Trout Capital USA, its tough to talk about much of anything else other than fishing around these parts, but Cotter Arkansas has so much more to offer. Cotter and the White River is fabled trout fishing at its finest. The historic town of Cotter rests on a horseshoe bend in the river roughly 18 miles downstream of the Bull Shoals Lake Dam. With over 4 miles of riverfront access, Cotter is smack in the middle of the world famous stretches of river tail-waters that produce not only enormous fish, but lots of them! 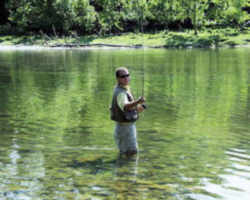 With clear, cold waters being generated from the depths of two lakes, the White River produces trophy Rainbow, Brown and Cutthroat Trout throughout its first 50 miles, attracting fishermen from all over the world to come here and try their hand at fishing in the Ozark Mountains of North Central Arkansas. Field and Stream and Outdoor Life have both rated Cotter and the surrounding Twin Lakes Region as one of the top fishing and retirement destinations in America. So whether you're an accomplished fly fisherman, spin caster or novice, you'll have the time of your life making Cotter either a permanent dwelling or a vacation destination for the whole family! When you've caught (and maybe released) your limit of rainbow trout, you'll want to stroll around Cotter's historic downtown area to see the restored buildings, and shop for antiques or a special gift for those you care about. 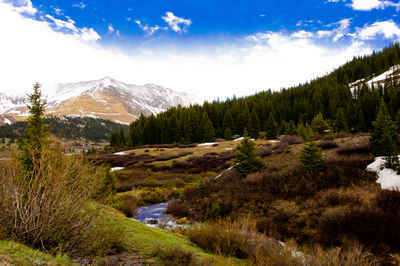 Cotter offers restaurants, lodging, camping, shopping, parks, springs, trails, sightseeing and relaxation at its finest. Cotter is in north central Arkansas on a major east-west route. Cotter is a city in Baxter County, in the Mountain Home metro area. The community is in the Central Standard time zone. Highway 412/62. Perched above the White River's banks on a cliff, the town catches the eye of travelers from a scenic overlook on Highway 412. 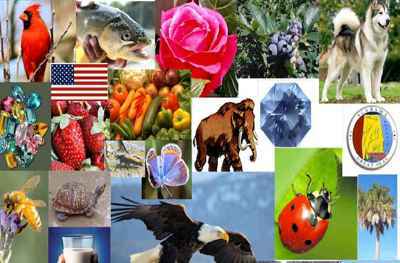 Serving the local traffic and outlying communities are State Highways 126, 178, and 345. The river enfolds Cotter on three sides and provides its recreational and occupational lifeblood. A highly traveled north-south route nearby is US Highway 65 from Des Moines, Iowa, to Natchez, Miss., through Springfield and Branson, Mo., and Little Rock, Ark. US Highway 65 is about 35 miles west of Cotter. 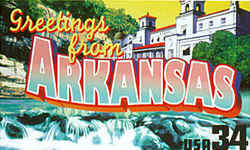 A popular vacation destination itself, especially for trout fishermen, Cotter's central location in the heart of the Ozark Mountains provides easy access to the boating and water sports of area lakes as well as the entertainment opportunities of the Folk Music Capital of the nation to the south at Mountain View, Ark., and country and "oldies" music to the north at Branson, Mo. The law designating the City of Cotter, Arkansas as the official Arkansas state Trout capital of the U.S.A. is found in the Arkansas Code, Title 1, Chapter 4, Section 1-4-123. § 1-4-123 - Trout capital of the U.S.A. The City of Cotter, Arkansas, shall hereafter be known and may be referred to as the "Trout Capital of the U.S.A".